Every year during the post Christmas slump, the local restaurants boost their lagging reservations with the annual Dineout Vancouver Festival. Over a period of 17 days, hundreds of restaurants entice diners with price fixed menus at $18, $28 and $38. One of the hardest things is choosing which restaurants you'll choose to visit. Some of the restaurants can be real duds as they will serve inferior versions of their menu and can be less hospitable in an effort to churn out as many DineOut reservations as possible. Fortunately, Wildebeest was not one of them. 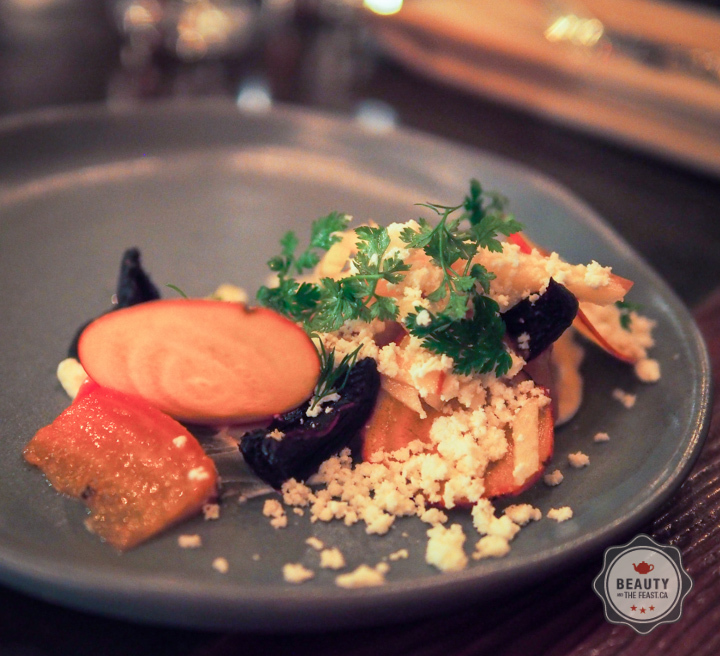 As a recipient of Best New Restaurant 2013, and Best New Design 2013 from Vancouver Magazine, I had high expectations. 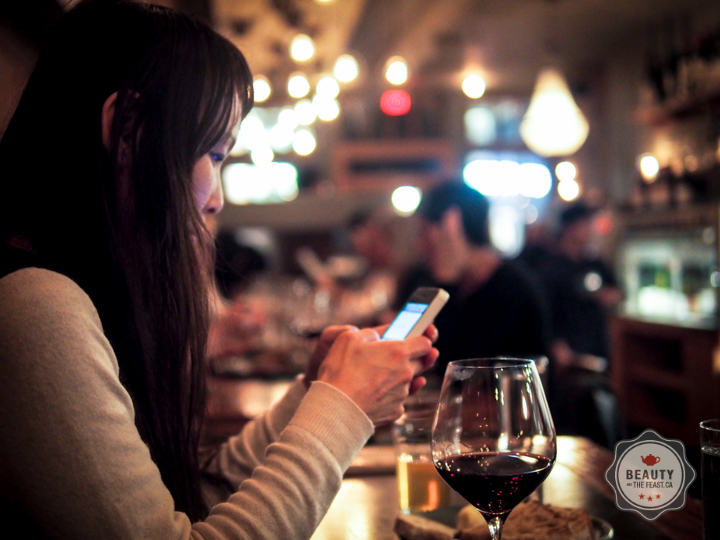 The restaurant is in the hip area of Gastown - Downtown, where many of the most innovative restaurants can be found. They serve menu local, seasonal-sourced, organic and sustainable harvested menu with a heavy emphasis on meat - nose to tail. Even on this school night, the restaurant was bustling. We were seated within 10 mins of our reservation and got an excellent table right by the chef's station. Bearded men galore. My friend Barb would approve. Here's what we was served. Appetizers were solid. I felt the beet salad was very small, but the combination of a variety of raw beets cut in different textures, combined with the sweet crisp apple made it extremely interesting to eat. The lamb was fresh, mild and not very gamey. The mustard seed gastrique really punched it up. Mr. BATF felt there wasn't enough bread for the generous portion of meat that was provided, which our server rectified with complimentary bread. I coveted my friend's cured confit trout salad. Lovers of lox would love this smokey, buttery preparation of trout. I could eat it every day. Grilled Hanger Steak Spirit View Ranch hanger steak, nasturtium 'chimichurri', potato 'Lyonnaise'. The steak was juicy and surprisingly tender - perfectly cooked. I expected hangar steak to be pretty tough but this was really nice. The Ling cod was fresh and sous vide is an elegant preparation method but I found the fish a little bland. This made me sad as I'm a huge fan of ling cod. Still good but it was a little bit weaker then the other two. The Chicketta is chicken prepared in the porchetta-style (see Meat and Bread). I thought it was savoury and mouthwatering, however it did not excite Mr. BATF. Dessert was incredibly exciting with different textures and flavor combinations to sample. Crunchy, silky, spongey, sweet and savoury... A real delight for the palate. 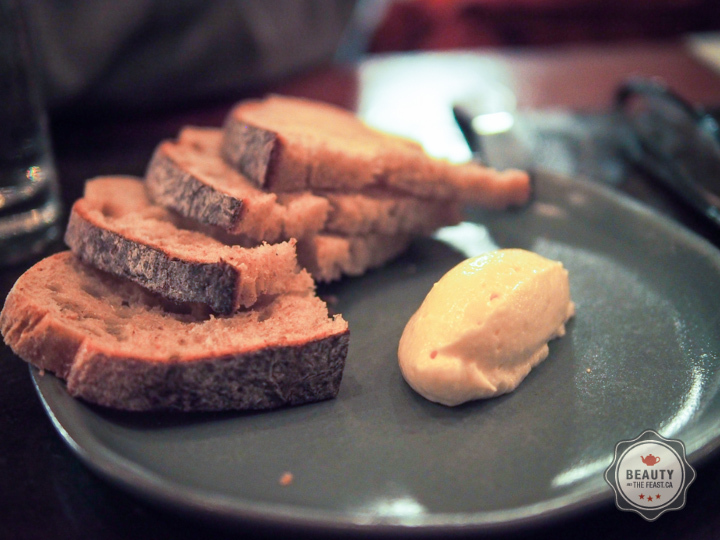 We also ordered the marrow butter with fresh baked bread. I did not enjoy this as I felt it was too gritty and metallic but I think this is how it is intended to be served. My dining companions found it appetizing enough. 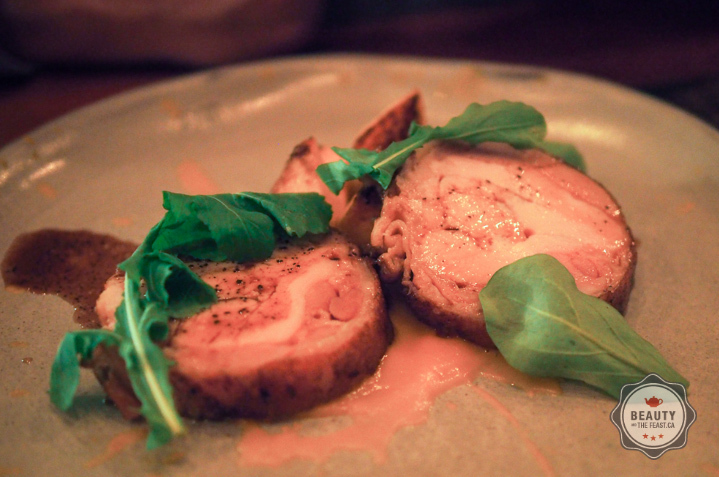 Review: Wildebeest is a beautiful restaurant. Upscale, skilled preparation of food in a casual environment. Reservations are must. Best enjoyed with friends, or a date you want to impress. Book your table by Feb 2 if you'd like to try the same menu. $38.